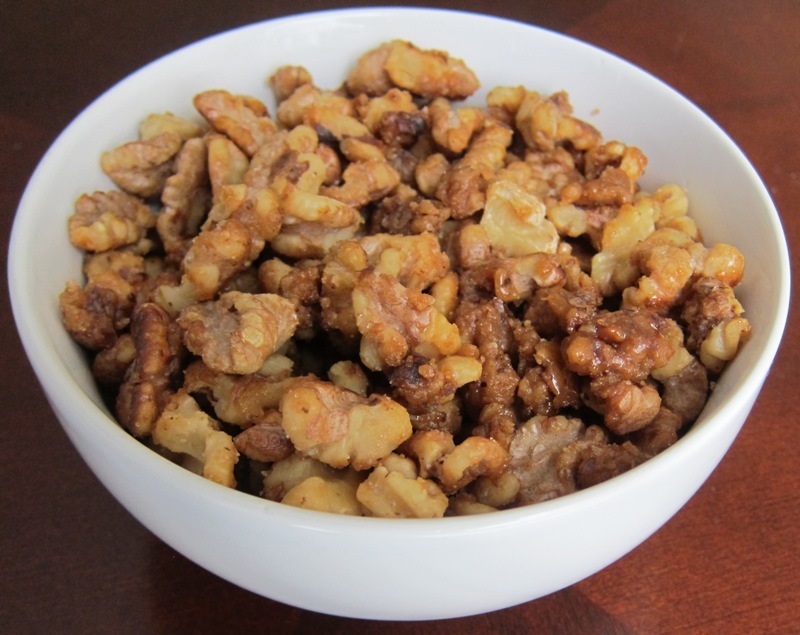 Candied walnuts are extremely addictive – you just can’t stop eating them until the bowl is empty! There are many ways to enjoy candied walnuts – you can serve them in a bowl as a party appetizer or a snack, mix them with some raisins or other dried fruit as a trail mix or add them to salads. If you try to find candied walnuts at the store, you’ll have a hard time finding them – not too many stores carry candied walnuts, and when they do, their availability is not consistent. Your best bet is to make candied walnuts yourself! Enjoy these yummy candied walnuts and try not to eat them all up in one sitting 🙂 Also, check out this great salad recipe that uses candied walnuts – it has spinach, dried cranberries, avocado, feta cheese and orange slices – so yummy – party salad recipe with candied nuts. 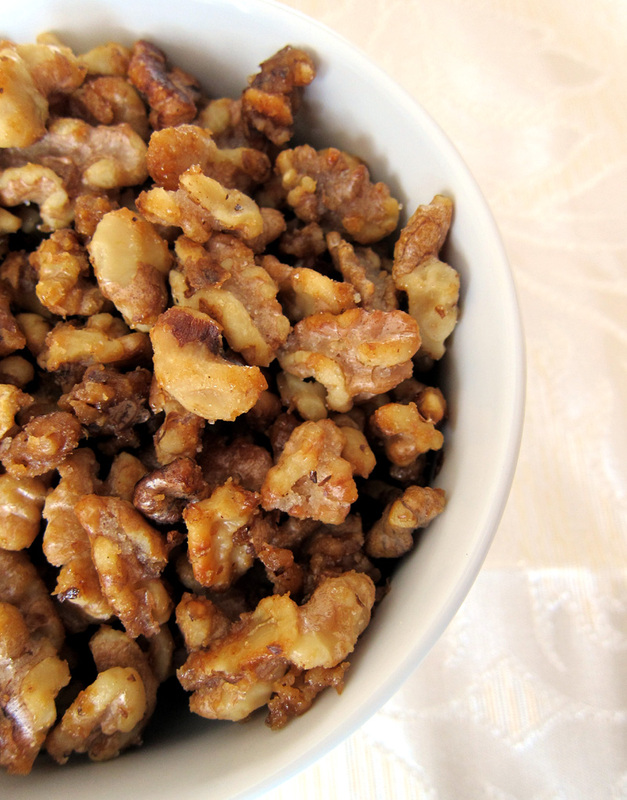 These candied walnuts are so addictive, you'll want to eat the whole bowl in one sitting! 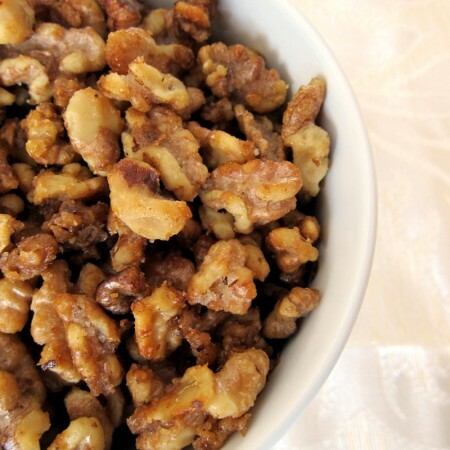 Great as a starter or as a salad topping, everyone loves these candied walnuts! Super easy to make! Heat butter in a large non-stick frying pan over medium heat until butter is completely melted. Add brown sugar and walnuts to the frying pan and mix. Cook, stirring every 30 seconds, until the sugar is completely dissolved (about 4 minutes). 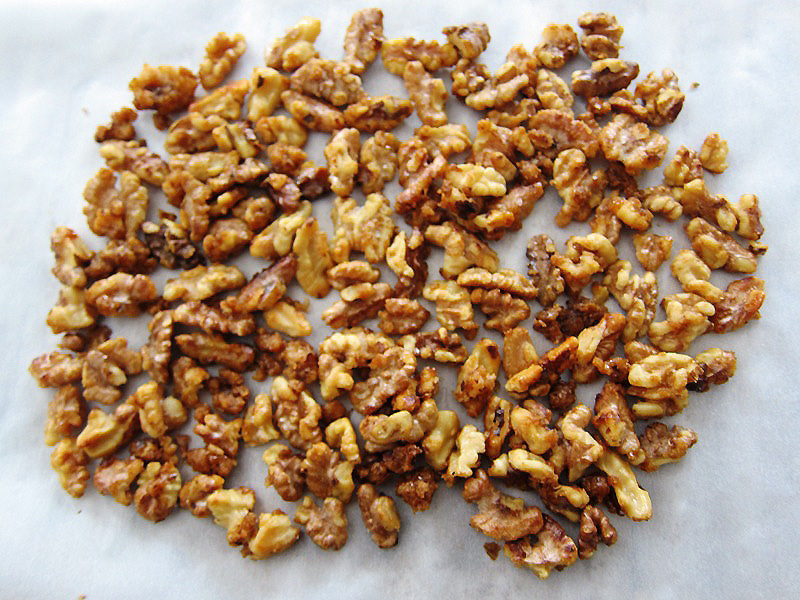 Remove candied walnuts from the frying pan onto a baking sheet. Put the walnuts on parchment paper in a single layer and spread them apart so they are not touching and don't stick together. Let them cool for 30 minutes. After the candied walnuts are completely cool, put them in a bowl and serve. I love how easy these candied walnuts are to make. I love nuts, so this would be a great recipe for me. Walnuts are the healthiest nuts out of all of them – I’ve read that they contain twice the antioxidants of other common nuts! That’s another excuse for me to eat more of these goodies 🙂 And yes, they are extremely easy to make! 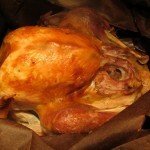 Thank you for such an easy recipe! I remember these as a young girl many moons ago. 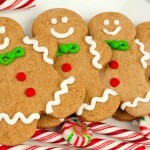 One of my favorite holiday treats, and now I can share the simple joy of candied walnuts with my grandchildren.